Welcome to part 3 of a multi-part post on moddng the Acer Aspire One! First, I’d like to apologize to those who have been waiting patiently for this mod. Since I posted parts 1 & 2, I’ve been quite busy with work and other distractions, such as Burning Man and my trip to Finland. To make matters more difficult, some of the parts I ordered took 2 months to be delivered. Second, this mod was pretty difficult, but it was definitely worth it. Some things, like soldering the missing mini-PCIe connector, only required the right skill and equipment. Other things, like getting power to the mini-PCIe card and wiring up the SIM holder, required a lot of trial and error. DISCLAIMER: If you’re not experienced doing precision soldering with a fine-tipped, temperature-controlled iron, using soldering wick & flux, as well as proper magnification, then I suggest you avoid this mod. I’m not responsible if you damage anything. In fact, one of my SIMs was destroyed in the making of this mod. 1) Solder the mini-PCIe connector. By default there’s no power to the connector until you install this jumper. 2) Chances are you’ll have to modify the SIM holder to match this pinout. Be creative! If you’re lucky to find the right SIM holder, just solder it on and email me the manufacturer/part #. I’d like to thank JKK for providing me with a physically (but not electrically, oops) compatible SIM holder. By default there’s no power to the SIM holder, until you install this jumper. 4) Inside the Sierra Wireless/AT&T AirCard 875U or 881U USB modem there’s a mini-PCIe 3G card. Who knew? If you’re looking for a reasonably priced, unlocked 875U or 881U, go here or there. The pictures show the end result. I used the mini-PCIe card from my Sierra Wireless AirCard 875U together with the Sierra Wireless 3G Watcher. With this mod, I managed 2084 Kbps down and 347 Kbps up. That’s very good! Update: Since originally doing this mod, I’ve relocated the antenna from under the palm rest to inside the screen lid for better performance. The wireless switch is actually a 2-way switch – slide it to the right and it turns WiFi on/off, slide it to the left and it turns the HSDPA radio on/off (see video). By default it can only slide to the right to turn the WiFi on/off until you file the plastic cover, thus allowing it to also slide to the left! It was only last night that I decided to go ahead with this mod myself and order the parts – only I went for a small USB 3g adaptor, and was going to hack it up with a similar push-push sim slot and 3g antenna (basically a variant of your BT mod). Oh well, I can still order the PCIe slot/card and give this one a go instead. It seems a much neater way of doing things. I’m surprised it works though – there seemed to be a number of missing components around the PCI-e slot when I took a look at the board during an HD swap. I had assumed many other components would be required to get the slot functional. Anyway – many thanks for posting this up. It looks like the Sim slot I’ve gone for is slightly different from yours. I’ll let you know if it’s compatible. Would this mod also work for the Dell Mini 9? except that it wouldnt require the sim card slot since there is already one behind the battery? Thanks in advance for your help. Would it be possible to use the 3G card JKK used in his post with the built in SIM card, rather than install a secondary SIM card adapter? Or is there no room for the added bulk of that adapter? Beautiful hacks, I can’t wait to do these to my own One. This is probably a stupid question, but I haven’t ever worked with or even used SIM cards. But if you use an unlocked SIM card for internet use, is it free? Or do you still have to pay per month? Great job with these mods, was looking around for a better way to get Bluetooth on the Aspire One when I stumbled onto this site. Alot of great stuff on here. Keep up the good work! This is very cool. Do you mind to tell us where you get your parts? And also, I am with t-mobile in NY and not plan to change it. Do you see any mini pcie operate at 1700/2100 frequency? thanks. 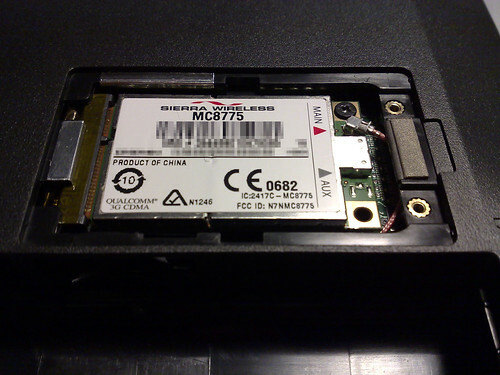 If you get an 881U (usb) sierrawireless datacard and you open it, you will find a MC8781 inside..
That module has also a GPS inside it. I suspect that the SIM Card connector you need for this is an FCI connector either 10056619-009LF or 10056619-109LF. Have a look at http://www.fciconnect.com to have a look at these connectors. I don’t think they have it anymore.. Try looking for both 10056619-009lf and 10056619-109lf all around and can’t found one..
First very impressive work! I wish I was as electronical gifted as you are ;) Well that said, I have taken a gamble and tried the mod, well not the whole mod, I just soldered the mini pci-e adapter to the board, the installed the bridge to power the mini pci-e port. I don’t have a 3G mini pci-e card yes but I do want to try if my soldering was correct so I thought I install the wireless adapter in that slot, I turn the One on. It boots to vista but in the device manager nothing shows up! I then tried to tape of pin 20, but still no luck. Is my soldering bad or do I need to tape of another pin on the acer one wifi adapter? Thank you for you response and keep up the good work! This is the mod I’ve been waiting for. Really dumb question: If I only intend to use EVDO, can I skip the whole sim card part of the mod? Can you confirm that part 4 eSATA will be added? I found an in-stock miniPCI connector at http://www.mouser.com. Just stumbled(not with stumble) on your site when I was looking for information on the Aspire One. Really enjoyed what I’ve read so far and plan to come back alot. The only thing I want to know is why the guy at CNET UK has an Aspire One with the HSPDA installed from the factory and why do we have to mod the silly thing in the US? Thanks. IT could be much easier to buy the Novatel Wireless EU850D modem, which has the SIM holder on the modem (if it fits in the case). For that modem, I know that pin20 can be disabled by a software tool. thats interesting… but cant find a place to buy this within europe..
Has anyone done a 2Gb upgrade (2.5Gb) with on board ram??? Kent – While researching the Aspire One, I recall seeing that the BIOS would NOT recognize 2GB. I went w/ a 1 gb stick from newegg ($14 total) and will try the mod in the next day or two. hey – i’m thought about doing the soldering to upgrade my aa1 with a second and faster ssd. seems like runcore and mydigitalssd are selling quite cheap mini pci ex ssds. but they are all specific for different computers. like eee / dell ins. mini. now i’m asking myself, if the pinout will be the same with all of these cards and if i arrive at soldering a card holder to the board, will it accept these cards? Does anyone know where to buy the sim card socket, or the miniPCI-e connector? Samples are all out. just as sdf_beanhead stated, “Does anyone know where to buy the sim card socket, or the miniPCI-e connector? Samples are all out.” I’ve tried contacting several electronics supplier with none in stock. As I understand, there will be a hole in the mini-pci to put the SIM in, then why we need SIM Holder to holder ? midiwall, does that mean you can install a 2 gb stick but it will only recognize 2 gb not 2.5 gb? I tried to replace WiFi card on existing mini PCIE slot with EVDO Novatel E720 mini PCIE card and the One won’t post. This card has integrated GPS and will be great addition to AA1. Compatible with Linux and MacOSX will fit perfectly into my triple boot machine. Any suggestions? Would it be reasonable to assume that once the Mini PCI plug is soldered, ANY Mini PCI card could be used (for which drivers exist). I’d prefer staying with my current provider, Sprint. Also, no SIM card to worry about. Nice mod! But I wonder, can it be peformed on linux version? Well, my Aspire one is running on Windows XP Home Edition. How I can I upgrade the OS to WinXP Pro? It wont boot to an external DVD drive nor a USB flashdisk. when you say it won’t boot via external DVD drive… try plugging in the external DVD drive, rebooting, then press F10 to change which device the Aspire boots from. You should see an option with a description that sounds somewhat like your external DVD drive. And it may even say usb DVD drive or something similar. Hey! Now I can upgrade my OS to WXP Pro. Thanks to jason!! XP Pro, here I come….. I sent you an email, only PATA/ZIF hard drives works on acer aspire one? ATA interface like Toshiba MK2004GAL or Toshiba MK4004GAH works too? Thanks for your time. can anyone offer some help? i really want to do this mod to my aspire one. tom, do you still have one that I could get? I ordered the PCI-e connector that cica suggested above (part# 67910-0001 at mouser.com), had my computer apart, soldering iron in hand…. and realized that it was only 4mm tall. I called Mouser and they told me they would be happy to sell me a 9mm connector… in quantities of 300. Augh! I can’t find one either. thanks a lot for the wonderful job. Samples directly from the manufacturer are sometimes 10x faster then from a electronics supplier since they maybe out of stock and don’t want to order only one from Molex. hi.i ve already put a 160 gb sata hdd in my acer one.it work just perfect.its easy to do this midifications,just need a 22 pins sata connector to solder in the board and put a jumper for the 5 volts and its donne! I applaud tnkgrl and others who have published their efforts and “How to Mod” guides for the AA1. I want to perform the 3G Mod on my new AA1 too but am having a very hard time finding the parts. As others have already aired, the 9mm PCIe mini connector is nowhere to be found in stock. The SIM card connector in tnkgrl’s instructions says 6 pin SIM connector, but the AA1 motherboard has 8 pin pads for an 8 pin SIM connector. So I don’t know which SIM connector type to use (if I can find one). All the 9mm PCIe mini connectors are out of stock and obsolete at MOLEX Inc. So, tnkgrl and others who have performed this mod successfully, can you please rely and tell us where you were able to get these parts? Thank You so much! I wish someone would answer on where they got the parts from. Will a 5.7mm height PCIE mini connector work in the Acer Aspire One? I got the 4mm high one and it is too low to clear the compartment. Time and money wasted. Where to get the 9mm PCIE mini connector tnkgrl? Do you have extra spares to sell? Thank You! Then, all you have to do is order samples from these manufacturers (except for the antenna – I purchased mine). That’s it! Thanks for replying tnkgrl! FYI, in case you have not checked the Molex link lately, it says this particular pcie mini connector is ‘Obsolete’. I did put in an order for a sample of each connector type anyway to see if maybe they will ship a left over part in their inventory. We’ll see. Do you have any idea if the 5.7mm high PCIE mini connector will fit properly in the AAO by any chance or is it also too low? Much thanks and appreciation for your great work and sharing with us! Hey there, I’m typing this from my AA1. I’m getting ready to install a 1.8″ from an IPOD. Then I want to do a Wireless Card modification much similar to this. I’m a business sprint user and was wondering if it’s possible to do this mod with any of the sprint evdo wireless usb cards? Did anyone manage to get 9mm height connectors? I also tried Molex, but obselete with no remaining stock!! Does the 5.6mm height work in the AAO? I am about to buy a Acer Aspire One 10” I want the 3g, is it possible to use your mod on it, or is the body too different. I don’t really want to go to Radioshack and see if they’ll install the 3g components, the ad so far look like a big rip off. oh yea, If I can do your mod, can I get that plan from a phone service without getting a 3g phone, I don’t want to spend another 400 dollars needlessly. I enjoyed your mod vids, they are very cool, I’m a novice just starting out with electronics. sorry about my poor english, i upgraded my aspire one with an ipod 80gb 1,8″ hdd. the bios recognize it but the xp installation says can´t acces to disk and sow an blue screen of death. i try low level format the drive but i can´t cause an error says password protected, i don´t put any password and the ipod runs ok.
Tnkgrl can you tell me if it is possible to mod the acer aspire 10”, I really want to try for the bluetooth and 3g on the newer model, but they changed the internal structure. Can you get back to me on this, and possible tell me how to do it? I don’t have the new 10″ Acer Aspire One and until I can get my hands on one (ie. until my budget allows me to get one or someone can buy/lend me one). there’s nothing I can do to help you… I don’t know what it looks like inside! Tnkgrl sorry about my poor english, i upgraded my aspire one with an ipod 80gb 1,8″ hdd. i think it needs low level format or similar, do you know how to make it run? I’d just like to say a big thank you for your video on modding the Aspire One. The video helped me BIG TIME! I would’nt have even opened it up if it wasnt for your video. I completed what I needed to do and put it back together … 100% sucess Thanks!! 67910-9001 is scheduled for obsolescence, but that is better then 67910-9000 which is already obsolete. I tried to get the lead free part(67910-9001) from Molex and was told it was no longer available. They sent me 4 mm parts instead. Does that switch function right after you cut the case and remove the tape on pin 20? Hey, I can not locate Molex connector 0679109000. I want t add a sprint Mini PCI connector to my Acer – but am unable to locate the part #. I’ve tried ordering a sample from Molex, but they say they’re out of connectors! Had to remove the 3G shelf in the lower case and move it .075 higher, while shaving .075 off both the motherboard and daughter board’s mounting bosses. When you get the chance to, please share where you found SPPN06A000040 and what your success has been been in implementing it. Once I’ve seen this work out in totality for someone without having to be MacGyvered (i don’t feel like modding a sim card adapter), I’ll be ordering the parts. Also, to all, Looks like 67910-0001 is available from mouser but you need to request a quote, whereas 67910-0002 is available to order no prob. I’ve tried to access the datasheets but they seem offline at the moment. My experience tells me that it’s likely a different size. 67910-0001 and -0002 are 4.0 mm tall. Acer used 9.0 mm tall. 5.9 was very hard to MacGyver, but 4.0 would be impossible. a 9.2 mm tall mPCI-e connector is available, P/N 119A-92C00-R. I have some coming, will report if they are .2mm too high. SPPN06A000040 and all sim readers I found require MacGyvering due to Acer’s backwards layout of the connections on the motherboard. Email me at trudelle@email.com with email subject of “SPPN06A000040 source request”. Just so you know, it is expensive to get a couple from china. I find it somewhat ironic that the hardest mod to do should, technically be the simplist (seeing though the AA1 is already set up for 3G as there’s a compartment for the module and a Sim slot in the casing under the battery). I wonder if you’ll be able to buy a 3G module specifically designed to fit the case, or whether you can get your old non-3G’s upgraded. Any mini PCI-e 3g module will fit. As Tnkgrl pointed out the Sierra Wireless Aircards 875U and 881U have MC8775 and MC8781 Mini PCI-e cards inside. Upgrading a Non-3G to 3G, is a Do It Yourself project at this time. I may offer my surplus parts for sale as a kit at some point, when I complete the three I started. This is awesome!! How hard would it be to add an outboard Expresscard receptacle? I would love to use my Aspire One with my RME HDSPe Expresscard. At this point in time there are no available PCI bus lines on the motherboard to add an Expresscard. Besides that there is the physical requirements of finding space for the card and connector. I am working on adding a third Mini PCI-e slot in the bottom of the Aspire One for a USB mini PCI-e card. It is a pretty straight forward modification. I meant one that allows you to insert a sim card through the slot under the battery. Although I opened up my AA1 last night and couldn’t see how it could be done as there are too many physical obstructions between the module compartment and that hole. I may, and often are, wrong. I’m not sure I’m brave enough to go with this mod at the moment, but I may see if I can get my hands on a cheap USB PAYG 3G dongle and see if I can hook that up. Apparently there’s a built in USB hub with the touchscreen kit I’ve ordered, so I should be able to hook it up somehow. it works perfect!!!! but too thick !!! the issue is to add 3G it is a problem now as the card is a little bit high!!! The connectors arrived and the 9.2mm connector (119A-92C00-R) fits fine. miamijerry, where did you order your 9.2mm connector from? Searched and see no consumer outlet selling them. If you are looking for one.. here the one i got.. Awesome mods… I installed the ram and was looking to put in the bluetooth soon, but I ended up falling on my laptop (fell off my mtbike onto my backpack..). Now the screen is just a clump of vertical lines… Ubuntu (my OS) loads properly, I can hear the welcome tune after I boot, but the screen only shows the vertical lines… do I need a new screen or am I just jacked? There is no visible damage to the screen. Email everyone at Attend Technology (Google 119A-92C00-R). Request 10 each as samples. Sell what you have left over. You still have to get the Sim reader. Thanks, I had already done that. But their webpage ordering cart does not seem to work. I used “Contact us” on their site to write a request for two samples but after hitting to submit, the page gave an error. I did however get an email generated back to me, so let’s see if they respond. I’ve not heard back from them. How long did it take for them to reply or respond to you? please would you send me one I participate on the cost. I also orderd to Molex but no answer yet!! 3 weeks!!!! tom, well it cost $20 to have them shipped to me from Taiwan. I received them but have not begun to reopen my Acer PC to solder it in place yet. I am waiting to see if I can get the proper SIM connector now first and then open it up and put them both in. If you are willing to split the cost plus mailing to you, I will send you one sample 9.2mm PCIe mini connector. miamijerry, yes I got my supposedly free samples but they really were not free as they charged me shipping from Taiwan to the states! Most other manufacturers or suppliers I believe ship free samples for free. But I don’t mind as long as you are sure this 9.2mm fits and works well in the Acer Aspire One 8.9″ display model. I have not tried to fit it in yet. I don’t have the proper SIM connector. I got two different SIM free samples from somewhere a while back but they don’t mate. I have to figure out if I can hack it and maybe rewire the pins properly (like Tnkgirl did. But my SIM samples are different from hers, so I would need to be careful to figure out what pins go to where on the motherboard. Yes, I had to pay for the samples. I have mini pci connector 9,2 mm willing to exchange with the right sim holder! Кто нибудь нашел правильный Sim holder? Who has a right Sim holder? Here is a pictures of the Sim Reader rewiring and the Wifi button mod. Also there is a mPCIe pinout chart. The Mini PCIe connector from Molex has been discontinued, would this one work? Side by side with the Attend 119A-92C00-R, the only difference I see is the size of the contact area the pins have with the circuit board. Molex part the pins are shorter and narrower at the circuit board, I have not installed any 0483380090’s yet, but it would appear the part would be equal to the Attend part. Maybe easier to solder but also maybe easier to damage a pin. How much is shipping for any of the pcie sockets. I want to order the samples from molex, but I dont want to be charged a rediculous amount for shipping on my account. All I have is a FedEx account that is not mine. Anyone have an extra PCIe conector that they will sell me in the states? Molex did not charge me shipping on samples. but Attend ran a $100.00 Fedex shipping charge. I just installed the extra PCIE socket into the Aspire one. I am pretty sure all the connections work. I tried running a Dell bluetooth module in it but it doesnt even detect the module. I have installed my cheap ebay bluetooth module in the pcie socket and it detects it over the usb portion. Is there any reason I cannont get the Dell pcie bluetooth module to work? I have 9 extra connectors if anybody wants them. Just pay the shipping and its yours. @ Fei8lo – My guess is that the Dell PCIE bluetooth module is working off the PCI bus, which is not present on the 3G connector of the AAO. I am having a similar mod being done to my dellmini9 (install of internal modem). You have mentioned that you have relocated the antenna from under the palm rest to inside the screen lid for better performance. Can you advise exactly where inside the screen lid you placed this antenna? Also, how many antennae did you install? I was wondering if anyone had any extra sim holders. I am looking to do this mod and I would like to avoid buying 4 holders when I only need one. Please let me know. Do you know if the SIM holder can be soldered straight on the board of an Aspire One 110? Or if there is a mismatch with the pinlayout that require wiring? Is the jumper bridged using a piece of wire or is there supposed to be a capacitor on there? Did anybody manage to find a direct pinout match part for the sim card holder? I have soldered in the mini pcie connector cleanly (which you would think is the hardest part of this mod). Unfortunately whilst attempting to solder the short patch wires to the sim card holder I managed to trash it so need to order a new one (luckily I was soldering the wires to the sim holder before soldering them to the motherboard). I’d rather not go through that again if an easier route is available – ie a pin compatible part. this mod is possible on Timeline 1410/1810, and the new tablet 1820p series? anyone know where I can get a SIM holder from? you need only 6 wires. To be able to use the max 2gb ram – would disabling the on board 512mb work? This is an awful idea – but would physically slicing off the on-board ram work? Assuming every electrical trace is successfully open? I still have one PCI conector 9,2 mm. Would you send the pcie mini connector? Please contact my email address for physical address info. I heard that with MC8775V / MC8781V ,unlocked for voice functions,is possible to use Acer AspireONE as a cellulare phone and making calls. Does anybody know the how-to ?? The miniPCIe is only for 3G cards or will work with another modules as SSD, HD decoder or any type??? Most SIM holders should just solder straight on. Thank you for this tutorial. I’ll try this carefully. Hope i’m not found any problem. Thanks. I have tried the mod on Samsung N220 but still not go live yet! need jumper to power the pci-e and SIM holder. Any comment? I don’t know anything about the Samsung N220. I would like to try to modded my acer aspire one 751h without modem.. has someone of you tried to add a modem with sim card? is the old mod valid with 3g modems? I can use rework and solder station !! From what I hear, the second slot lacks a full PCIe interface being USB-only. That’s why USB modems and other similar stuff works, but Broadcom decoder doesn’t. I bought a USB only PCIE card for the second slot and put the HD Decoder in the original (internal) slot. hi guys, i’ve been installed netbook acer aoa150 zg 5 to windows 7 enterprise and try to looking for 3g driver qualcomm-hs-usb for win 7 ?, all device detected and workiing fine only 3G device undetected, do you know where’s i can find right driver for 3G device ? This is exactly the info I was searching for. Hey Hans which usb only pcie card do you have? Thanks Guys! I’m pretty sure it was the QCOM Q802XKG card from Mini-Box. Or I can upgrade to the Samsung, except I’ve already done so much on this one that it seems like selling out to buy another Netbook! :lol:. Hello, i have the Aspire One D255 model and the mini PCi-e connector required is smaller than the 9.5mm one used. Does anyone know where i can order one online ? These are two different sizes, I remember that they had a third size also. Careful. I have a KAV60 and the boards are totally different to the ones shown in the guide. I am not convinced the SIM pinout is the same in my model. It also has a pre-existing 3g mini PCI-e connector with access hatch. To add to the confusion there is currently an eBay seller selling the connectors and SIM slots marketed for both eee901 and Aspire One. I purchased one of the push push slots from them. It seems to be a Proconn SPPN08-A0-5000. It would appear that it is a direct fit for the 901, but the pinout is totally different to the one listed for the Aspire One. Again I will say that my board is totally different, and I can’t make a statement either way until I can get my case apart. One failed attempt so far. It is assembled differently to the One in the mods. I really want to get in there and test a few pins and trace some tracks to see what is correct for mine.